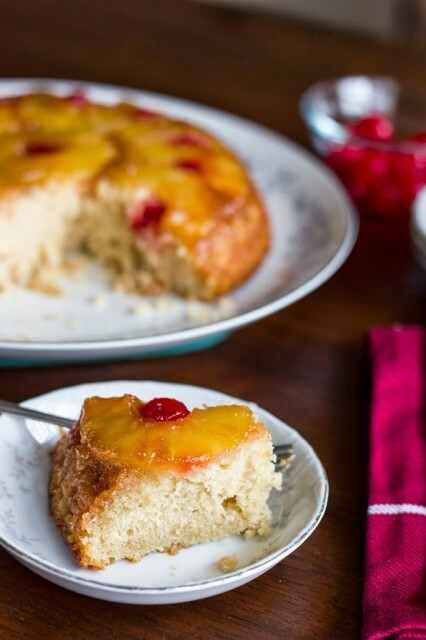 For some reason pineapple upside-down cake popped into my head a few days ago. I hadn’t had one in years and I’d never made one completely from scratch, so that’s exactly what I set out to do. Turns out there are lots of recipes out there for pineapple upside-down cake from scratch. It took me a while to filter through all the recipes and after (too) much deliberating I settled on this recipe from Sally’s Baking Addiction. The only thing I changed was how I arranged my pineapple slices. If you arrange your slices like I did, you get pineapple in every bite (and I just thought it was prettier this way =) ). It turned out great! 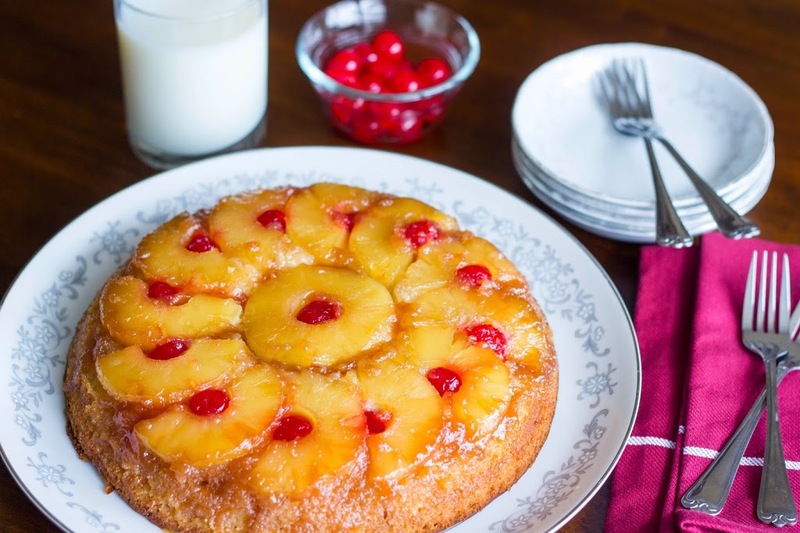 The cake was very moist and the buttery, pineapple topping was to die for, of course ;). It’s best when it’s still warm, but it’ll keep for a few days. I’d reheat the leftovers before serving. Enjoy! 2. Prepare topping first. Place 1/4 cup of melted butter into a 9-inch pie dish or 9×2 inch round cake pan. Sprinkle with 1/2 cup of brown sugar. 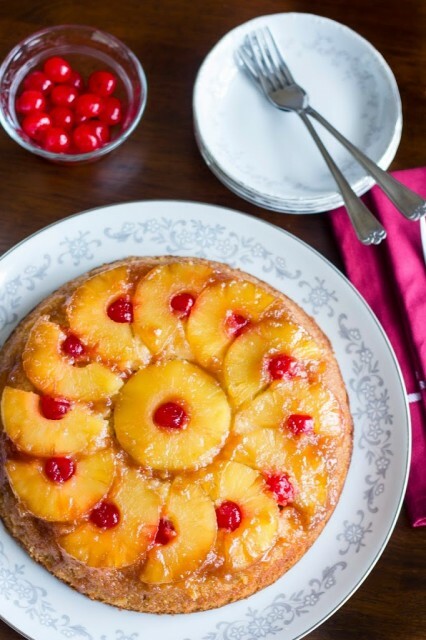 Top with pineapple slices and arrange cherries between the pineapple slices. See my photo for a visual. Set aside. 3. In a medium bowl, mix together flour, baking powder, baking soda, and salt. Set aside. In a large microwave-safe bowl, melt butter in the microwave. Whisk in the sugars vigorously getting out any brown sugar lumps – mixture will be gritty. Whisk in egg, yogurt, milk, pineapple juice, and vanilla extract until combined. Slowly mix in dry ingredients until no lumps remain. Batter will be thick. 4. Pour/spoon batter into prepared pan. Bake for 40-45 minutes or until a toothpick inserted in the center comes out clean. If top becomes too brown, cover loosely with aluminum foil. Allow to cool for 10 minutes. Invert cake on top of a cake stand or a large serving plate.